Your Twin XL Sheets are just as important as the rest of your dorm bedding. This is the layer that will be directly curled up in and you want to make sure you have ultimate comfort. Here you will find our selection of Highest Luxury - Bare Bottom, Bamboo Modal & Tencel/Linen/Cotton Twin XL Sheets. These Extra Long Twin Sheets will provide you with a bit of luxury in your dorm bedding, which is what you deserve. You want to invest as much in your quality of sleep as you do in your education, and here you will find the luxuriously soft and comfortable dorm sheets you need to do that. Add high quality cotton to your Twin XL Bedding with our 200TC Saudade Portugal Twin XL Sheet Set - Washed Percale. 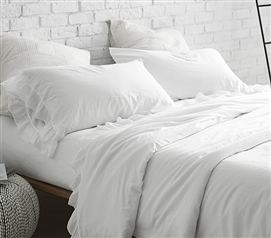 Make your dorm bedding luxuriously comfortable with our White Sand Tencel Twin XL Sheet Set. Add high quality cotton to your Twin XL Bedding with our 300TC Saudade Portugal Twin XL Sheet Set - Washed Sateen. Add high quality cotton to your Twin XL Bedding with our 300TC Violeta Folho Portugal Twin XL Sheet Set - Stone Washed Sateen. Add high quality cotton to your Twin XL Bedding with our 300TC Bom Dia Portugal Twin XL Sheet Set - Washed Sateen. Here you will find our Highest Luxury - Bare Bottom, Bamboo Modal & Tencel/Linen/Cotton Twin XL Sheets. These Twin XL Sheets provide you with the comfort you need and deserve for a quality night's sleep night after night with a luxuriously soft feel that you have to feel to believe. 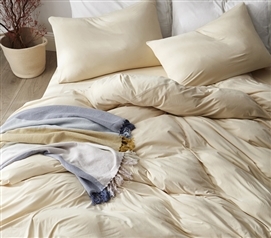 Curl up in the best comfort you can find with our selection of Highest Luxury Twin XL Sheets.